With over 10 years of Georgia Tech research experience, Irina is the perfect fit for the Team. 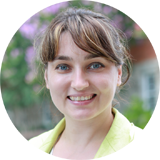 She is currently working on the Center for Accessible Materials Innovation research track on MSI's, part of the First in the World grant received by AMAC. When she's not reading papers on assistive technology, Irina likes to travel and explore the world.